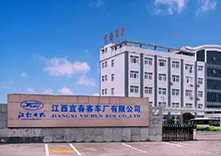 Jiangxi Yichun Bus Factory Co., Ltd. The after-sale service network provide perfect guarantee for the quality of Zhongyi buses. Jiangxi Yichun Bus Co., Ltd.